Everyone has a different understanding of what a large table really is. For some people, a table to seat 8 people is big enough. Others, on the contrary, are looking for a maximum seating capacity and search for a large dining table to seat 16 people at once. As a rule, this is the maximum seating capacity there is – provided you are looking for ready-made furniture rather than custom one. Safety glass – this is the most contemporary and stylish solution in the market. Glass will look especially impressive in a combination with chrome, metal, and high gloss furniture. The solution is perfect for hi-tech interiors. High gloss MDF – high gloss furniture is another modern option; yet, unlike glass, high gloss items can also be integrated into mixed interiors. The colour palette on lacquered MDF tables varies from neutral to wild hues, so the choice is almost unlimited. Wood – if you are trying to create a traditional, homey atmosphere in your dining room, no other material will cope with this task better than wood. Light birch or dark mahogany, neutral walnut or practically white pine – the selection is very impressive. Most large dining tables to seat 16 are rectangular. However, it is also possible to find some oval models. Plus, a tempered glass table may feature some additional decorative elements – like unusual leg design, uneven corners, etc. All of them will look great in a contemporary dining room. Traditional environment will mostly benefit from a classic rectangular wooden table. While looking for the table, take some time to consider other items you may need in your dining room – for example, display stands, cabinets, etc. Of course, some of the mentioned above large dining tables to seat 16 will not be cheap. In addition, you should remember that chairs are not always included in the set by default, which means that sometimes you will have to shop for them separately. Plus, hardly any set will offer you 16 chairs at once – usually, this number varies from 4 to 8. Six chairs is probably the most common option. In other words, a large set may sometimes cost a fortune. 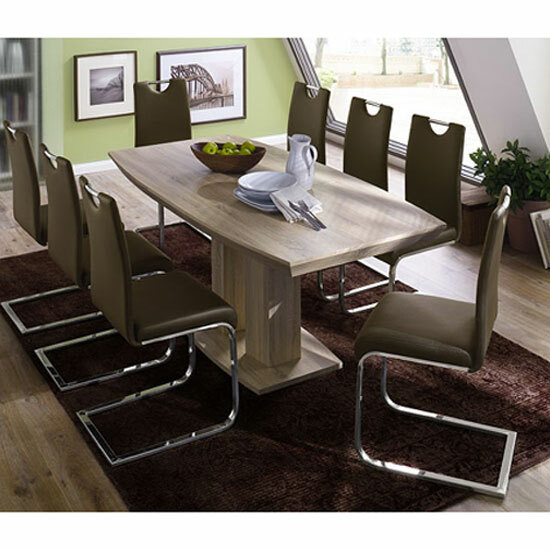 To save some money, you might try and find a large dining table to seat 16 at sales – most big furniture stores sell older, “leftover” items at a discount price, which is usually a very lucrative option that does not compromise the quality of the furniture piece you purchase.